...before Linda allows the hurtling car to land. All before that car could hit the ground! Could even The Flash of the Silver Age match such a showing? Comic heroes tend to be strong across the board. Kara was no exception, and we've already seen her performing tasks that require physical strength only the most powerful men and women you've seen on YouTube are able to do, with the exception that Kara could do them much faster, and while flying. Made her very adept at handling road rescues. However sometimes strength alone isn't enough, even Kara's redoubtable level of it. At least not as strength is normally expressed. No, you've got to throw out a few laws of physics for some comic situations. Got to do this as a 4 parter since, for whatever reason, splitting a 400 KB image into 2 parts gives two 278 KB images. How the magic of Microsoft photo makes that happen, I don't know. Fortunately, if Amp was right in what he told me before, this now 4 part entry will fulfill the 20-post certification needed to get actual LINK-posting permission, and I won't have to deal with such things anymore. This has been downloaded 183 time(s). The above was from Action Comics #350. And it's a cool showing, but it took a lot more effort to post than it should have. I've re-learned the value of saving before submission attempts. Because when image attachment submission fails, the board apparently wipes out all of the WRITTEN message sent with it. If he is, I can now transcend such things. I'll test whether that really is so with the following, another and even more impressive breath-ability showing from Kara, from the earlier Action Comics #305. I've cleared the 20-post hurdle! I can use LINKS now! I'm going to dinner to celebrate! A quick review of the images that were put in as message attachments to this point, but this time as "All You Can Upload.com" (AYCU) links. I do this to try to guard against loss of any single (or even set) of images. This way, if the KMC Image Hosting program fails, I can rely on AYCU. Conversely, if AYCU fails, KMC should still support it. What did Donna think would happen if she were mistaken? Talk about confidence in a theory! I have every intention of getting to higher level showings, but they won't necessarily come soon. Keep in mind that only 3 days have passed for me, Mike. It took the entirety of 2 of those days just to get clearance for posting links. I'm still trying to decide on matters of theme(s), form, and presentation. 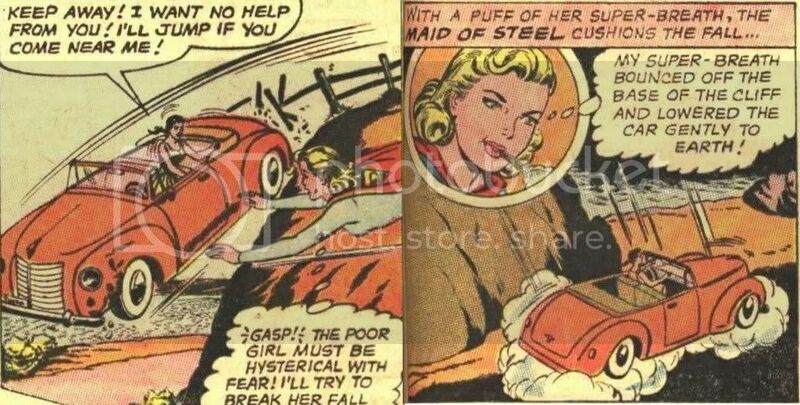 "John Byrne said that back in 1978 or 1979 when he saw Superman: The Movie, he noticed the audience mildly reacted to things like Superman lifting tectonic plates or buildings but they really sat up when he lifted Lois Lane's car and tore the door off. I noticed that myself when I saw it. Several people gasped when he ripped the door off. It was like all that other stuff was so far beyond reality that it didn't register, but that was close enough that people grasped how strong you'd have to be to do that." Perhaps I can use a "mirroring" technique and put some of these in proper perspective. Got a headache tonight and may quit before long, but, the plan is to post Sakara citation, Sakara image attachment, Sakara allyoucanupload.com image link, and a real-life youtube.com reflection of what is actually being shown for the present section of this thread. Bending the bars of a jail in red shorts costume.